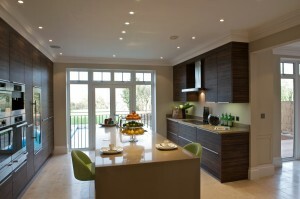 Contemporary kitchen designs are also described as modern kitchens - but the overall look and feel is very similar. 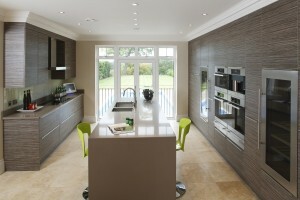 A contemporary kitchen is sleek and clean without the intricate detailing that you might see in a traditional kitchen. 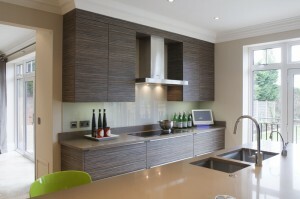 A contemporary kitchen can feature high gloss finishes, textured matts and luxurious real wood veneers to create a stunning cutting edge kitchen. Contemporary kitchens can include a handleless style and our recently completed kitchen designs and kitchen installations below showcase a broad mix of all of the above. This large, ultra contemporary kitchen and living space features the Burbidge Malmo Gloss White handleless door, combined with glass splashbacks to the wall and Silestone worksurfaces. Centre point of this kitchen is an original 1960's AGA, combined with SMEG Oven and Combination Oven, SMEG Induction Hob and an integrated Fridge Freezer. All kitchen cabinets feature LED internal lighting, in addition to 300mm pullout larder storage, plate stack drawer inserts and integrated internal bins. This large, bright contemporary kitchen features the Marpatt Airo door, in a mixture of Gloss Graphite and Porcelain and complemented by Caesarstone worksurfaces. 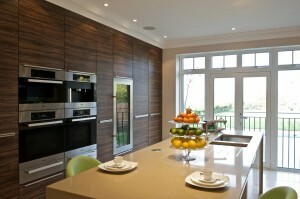 A large bank of appliances features twin De Dietrich Ovens, De Dietrich Coffee Machine and De Dietrich Combination Oven, whilst the island features a Bosch Induction Hob and Caple downdraft extractor. Additionally, there is a Bosch Integrated Dishwasher and a large Caple Sensio Wine Cooler to complete the modern, sleek look. This bright, large contemporary kitchen was created for a new build development and features a modern Amazona slab door from Unitech Oxon, with an integrated trim handle to provide clean lines and supplied with Silestone worksurfaces. A large bank of appliances features Miele Double Ovens, Miele Warming Drawer, in addition to Miele Integrated Fridge/Freezer, Miele Integrated Dishwasher and Miele Induction Hob. Supplied in a modern handleless design is this Second Nature Remo contemporary kitchen in a trendy Dove Grey finish and complemented by Silestone worksurfaces. Featuring a Neff Oven and Neff Combination Oven in the tall bank of units, this modern kitchen also features a Neff Induction Hob, Bosch Integrated Fridge Freezer and Bosch Integrated Dishwasher. This compact yet stylish contemporary kitchen is supplied in a Second Nature Avant Alabaster and the modern look is further complemented by Corian worksurfaces. This contemporary kitchen is full of appliances with a Siemens Oven, Siemens Combination Oven and Siemens Warming Drawer, paired with a Siemens Induction Hob. 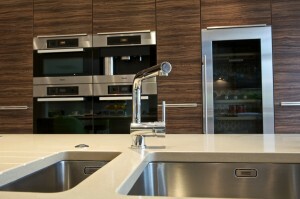 It also includes a Siemens Integrated Fridge Freezer and Siemens Integrated Dishwasher. This contemporary kitchen features a slab door painted in a lovely Gloss metallic Graphite and matched with Solid Oak worksurfaces. Supplied with a Bosch double oven alongside a Bosch induction hob, with an integrated Bosch dishwasher and Bosch integrated fridge / freezer. 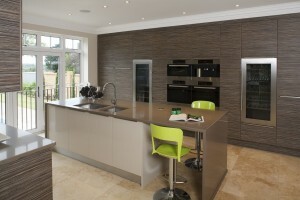 This larger than average contemporary kitchen has been supplied in the exclusive Second Nature Metris Kitchens Textured Wenge with vibrant Granite worksurfaces. 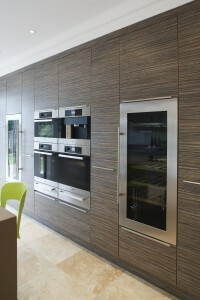 A large bank of appliances features two Miele Double Ovens, Miele Warming Drawer, in addition to a Miele Integrated Fridge/Freezer, Miele Integrated Dishwasher and Miele Gas Hob in the island section. Supplied in a modern handleless design is this Second Nature Remo contemporary kitchen in a light and neautral Beige finish and complemented by Granite worksurfaces. This modern kitchen features a Siemens Oven and Siemens combination oven, paired with a Bosch hob and Bosch integrated dishwasher. This modern, bright large contemporary kitchen was created for a new build development and features a modern Dark Cordoba slab door from Unitech Oxon, with an integrated trim handle to provide clean lines and supplied with Silestone worksurfaces. Following an extension, this galley kitchen gained further space and has been given a contemporary kitchen look with the Second Nature Remo Gloss White door and supplied with Granite worksurfaces. This modern kitchen features a Bosch double oven, paired with a Bosch warming drawer , Bosch microwave oven and a traditional gas hob. 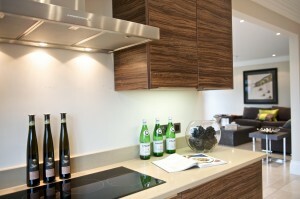 Additionally, there is a Bosch integrated fridge / freezer and a Caple wine cooler.